By trying to get in my healthy guidelines, I have been spending a substantial amount of the grocery budget on fresh fruit and veggies — but I am really enjoying the blueberries and strawberries that are on sale each week. For the past two weeks, I have been using the Weight Watcher’s smoothies — in chocolate and coconut — for my afternoon snack and they are a perfect treat! Inside the chocolate smoothie box, there is a small recipe guide — one of my favorites was the Mocha Frappachino, which uses 2/3 cup of milk, 1/3 cup of cold brewed coffee, a handful of ice and the smoothie mix — AMAZING. It really perked me up in the afternoon when I needed an energy boost and the best part was I didn’t have to pay $3+ for a pricey coffee drink. Add everything to a blender! Simple as that. It’s really delicious and creamy, not to mention all of the other health benefits. 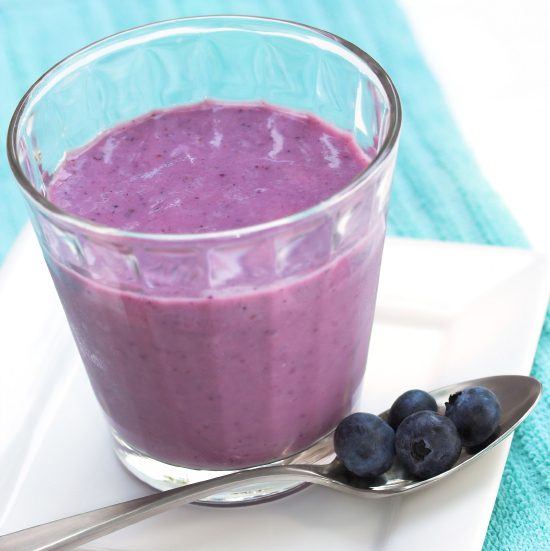 A one cup serving of the smoothie (the recipe makes 2 cups) is only 2 PP. I did it! After 16 months, I finally got into the 100’s — and so far this month, I’ve had a loss every single week totaling 6 pounds and I feel like I am on a roll!! I made it a challenge not to eat out from Sunday through WW day — I did it! 5 days of eating really good food at home and saving money from not going out to eat. I PLANNED the one day I would dine out — and stuck to that (which was breakfast/lunch that I pre-tracked at Taco Bell), plus I ate less than I usually do at Taco Bell and was FULL. Starting my no-dining out challenge TODAY. I have a great grocery list of delicious meals and treats that I am finding on Pinterest and my favorite food blogs. Still refrain from dining out. I’ll be in Los Angeles next weekend, so I know I can enjoy an In-n-Out cheeseburger and Dodger dog without feeling like I did bad all week. Start a workout plan. I’m just going to start slow — I need to keep with it so I don’t want to overdo it and then quit like I always do. It might sound silly, but I feel like now that I got out of the 200’s, I can truly focus on my weight loss. When I was over 200, I just felt like I was overweight and if I was anywhere in the 200’s, it was just the same overweight feeling. Even though I am 199, I can see where my efforts have taken me and continue to lose 10 pounds at a time to finally reach my goal — I am more focused than ever and hope to keep doing as well as I am now! Last Friday, my weigh in was 200.2 — and I won’t lie, I was pretty disappointed. Never mind I lost 1.6 from the week before or that I dropped 5.4 in three weeks — those victories didn’t seem to matter because I still hadn’t gone under 200 pounds since joining Weight Watchers in February 2011. I even got my 25 pound charm two weeks ago, and I didn’t even celebrate THAT! 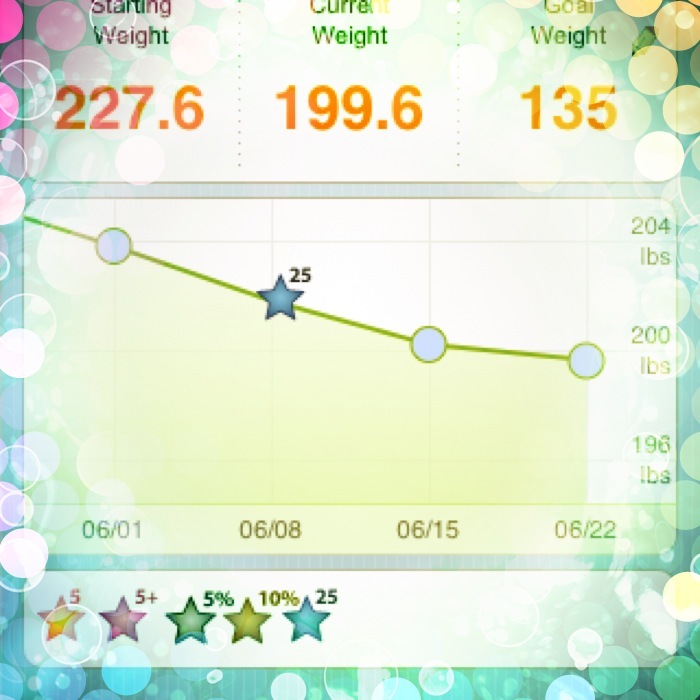 I have been so fixated on dropping below 200, as though just reaching 199.999999 would be a life-changing moment. I haven’t exercised for fear that it might reflect a couple pound gain on the scale before weigh in. I tell you, I really fixated on going below 200. This morning, when I stepped on the scale for a weight loss challenge and it still said 200.2, and my reaction was anger! I’ve been tracking everything, measuring my portions and trying to drink no less than 64 ounces of water each day. Why isn’t my weight budging? I had an epiphany this morning, and even though I’ll still probably struggle with letting go of the 199 pound fixation, it’s time to stop. As I said, I haven’t really exercised because I am afraid of a gain — but what I don’t realize is a gain one week will likely translate to larger drops throughout the coming weeks. I am not exercising and still losing one 1 -1.5 pounds a week — but my fixation is causing my weight loss to go so slowly! If I kept up with tracking and exercised, I’d hit that 199 goal and more in a shorter amount of time than if it didn’t include exercise. I need to start exercising now! I have a wedding I will be a bridesmaid in taking place in 1 month, 5 days. My dress is strapless, so I want to really get some cardio in and work my arms and shoulders — so I will really try to stop fixating on a number and just improve my lifestyle — those weight loss drops will happen if I just keep with it. In other good news, the last time I wore a bridesmaid dress in 2009, I was a size (gulp!) 22. This weekend, I went to try on dresses and I am a size 18. Slowly, but surely, I’ll keep going down in sizes. Sometimes the hardest part about being on Weight Watchers — for me — is I find so many amazing foods I have no clue what I want to make. I know that sounds stupid — but, I’m serious!! I’ve done Weight Watchers a few times before, and my recipes usually had to come from cookbooks I bought at the meetings…and they didn’t even have the kinds of food I see now in the WW cookbooks. On this current journey, there are ENDLESS blogs that calculate points, calories and nutritional content so tracking amazing food is easier. I wrote an article about just some of the great blogs I use — of course, one of my most favorite is Skinnytaste. I know most of you already know about these blogs, so I wanted to write one that showed people you can have delicious food without going overboard on calories. My current obsession is Eat Yourself Skinny. I love the layout of her blog, the breakdown of recipes and points and just the variety of dishes she makes. I am definitely going to be making that amazing Funfetti Cake Dip. I mean, really? At only 3 PP for a serving, I will certainly enjoy it as my after-dinner snack. You really need to check out this blog!! Last week I bought fresh mozzarella for a BBQ chicken pizza I made using a recipe from Cooking Light, and I had about 1/4 of a block of the fresh cheese I really didn’t want to throw away. I looked through Eat Yourself Skinny and found a perfect recipe to use up my cheese and a few random tomatoes I didn’t want going bad. Score!!! 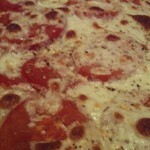 Margherita Pizza. It was tasty, fresh and easy to make. Great fresh flavors for a warm (almost) summer day!